Beirut is a city in a period of rapid transformation. One sees evidence of the devastation of its troubled past, but all around there is renovation and reconstruction, not just physically— the city is gripped by a desire for cultural change. It's an exciting and contradictory place. Whether or not, in the face of transformation, it can maintain some of its old charms is a debate current amongst its citizens. The reconstructed downtown looks like a film set—almost too perfect; a few metres away are the empty shells of bombed buildings. A promenade by the Mediterranean brings you in contact with a diverse group of people. Beirut is a complex place. Getting around the city is a challenge, there is little public transport and walking can seem unpleasant and dangerous due to noisy, chaotic traffic—drivers park their cars almost anywhere, often blocking pavements. But once you get the feel for it, crossing streets and negotiating the traffic becomes easier and off the main roads it's surprisingly quiet. Everything in this place is negotiable. Regulations have little power—red lights are often run—but strangely, it works. Cabs are cheap, every trip seems to be 10,000 Lebanese pounds, around AU$6-7. Around Easter in Beirut is the Irjtjal Festival devoted to improvised music (irjtjal means improvisation in Arabic). The event forms around a core group of musicians: Mazen Kerbaj (trumpet), Raed Yassin (double bass) and Sharif Sehnaoui (guitar), three brilliant players working at the very edge of experimentalism on their instruments. They have links with an array of European and American musicians and, excitingly, performers from Egypt and Tunisia. 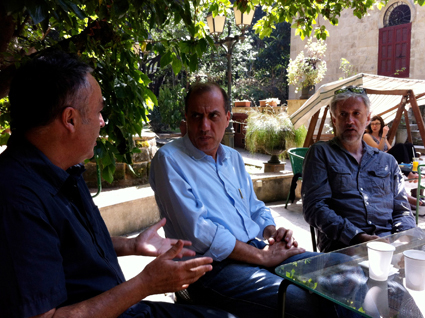 The festival takes place in a variety of venues throughout central Beirut. Straight after this festival is BIPOD—Beirut International Platform of Dance. Launched in 2004 as the Beirut International Dance Festival it offers dance performances by artists of different origins, workshops, conferences and debates in order to develop new concepts in contemporary dance. The Beirut Art Centre is also worth checking out, offering programs of exhibitions and performances. There are good bookshops throughout the city. I guess given Lebanon's history it's not surprising that the politics section is often large and quite radical. There are bookshops in the main street of Hamra and even Virgin Megastore in the Downtown area carries a large number of books on Lebanese history and politics. There are also little shops in Mar Mikhael, like Papercup on Rue Pharaon, specialising in art books. 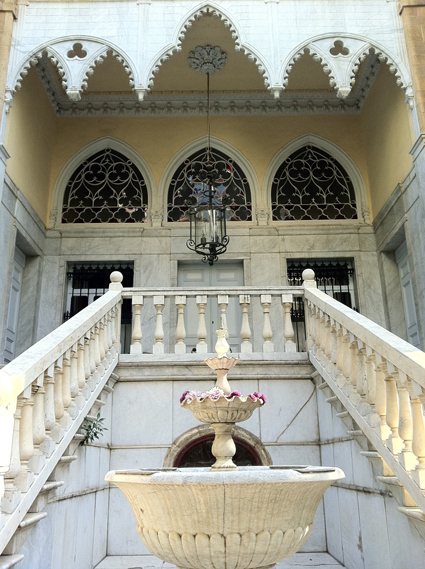 Metropolis Empire Sofil in Ashrafieh, at the heart of Beirut, is a two-screen theatre, also a café and a film library. The program is mainly art cinema. Eating in Beirut is a great experience, I didn't have a bad meal in my time there. For Armenian food, Mayrig (282 Rue Pasteur) provided me with one of the best meals I've ever had in my life. Armenian food is similar to Lebanese but with subtly different spices. I think the meatballs in cherries might have been sheep testicles—it was delicious. A good place for lunch is Basma (Sasadi Bldg, Charles Malek Ave) in Achrafieh. The menu seems to be modern meets traditional. One of Beirut's most famous landmarks—a massive seaside palace with swimming pool beach club and swanky eatery—is known by long-time locals as Café d’Orient or simply as La Plage by everyone else (Ain el-Mreisseh). 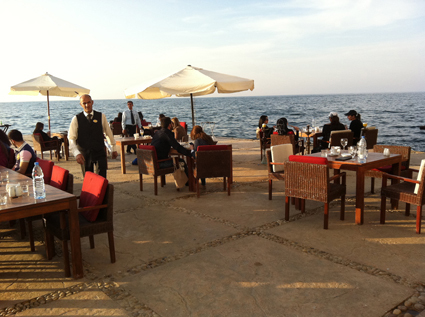 It's expensive, but a great place to sit and have a drink in the evening and watch the Mediterranean. Cheaper options are Barbar on Rue Spears in Hamra where you can pick up fresh falafel and kebabs till late. This popular chain sells manaeesh, shwarma, pastries, mezze, kebabs, ice cream and fresh juice. 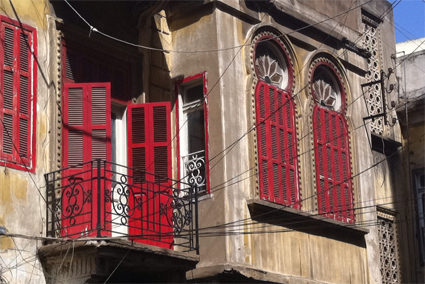 A walk around Bourj Hamoud just to the north of Beirut takes you into another world where Armenian culture dominates. There are lots of delicious and cheap places to eat. 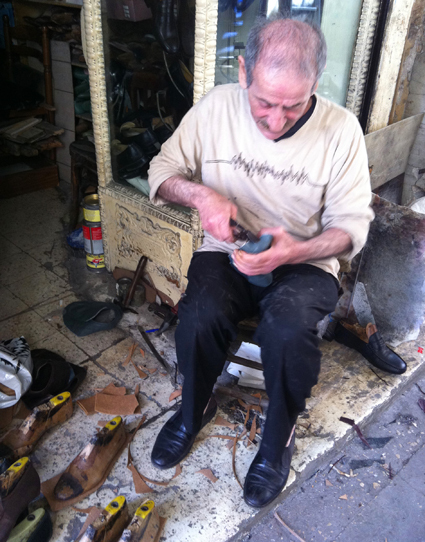 Bourj Hammoud was founded by survivors of the Armenian Genocide of 1915 and expanded mostly during the 1930s. They were given the right to construct shacks on the eastern banks of the Beirut River that, at the time, was swamp and marshland. Subsequently permission was granted to erect houses and buildings which stand to this day. If you have time, take the bus north 85km to Tripoli. The souk (covered market) and the old city there are extraordinary, and people are friendly and inquisitive—I guess they don't see too many tourists. Eat at Abdul Rahman Hallab & Sons (just ask, everyone seems to know this place) where the sweets are amazing and different from any Lebanese sweets I've had in Australia. Jim Denley is Sydney-based musician. Wind instruments and electronics are core elements of his musical output. An emphasis on spontaneity, site-specific work and collaboration has been central to his work. He sees no clear distinctions between his roles as instrumentalist, improviser and composer. Denley performs regularly at local, national and international events and festivals and also runs the record label splitrec.